I remember that I heard about these waterfalls on our visit to Rotupihilla Cave complex. Chandare mama told us about these falls but at that time we couldn’t have enough time to go and visit them as we had to go to Nuwaraeliya before the night. 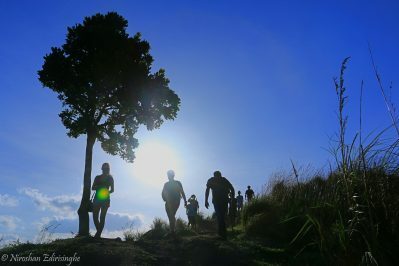 Conical Hill is the 10th highest mountain in Sri Lanka which is height about 2166m. It is also a forest reserve which belongs to the Forest Department (DFO-Nuwewaraeliya). Rathnapura district is blessed with highest number of waterfalls in Sri Lanka. This is about waterfalls come across around A4 road from Eheliyagoda to Rathnapura. 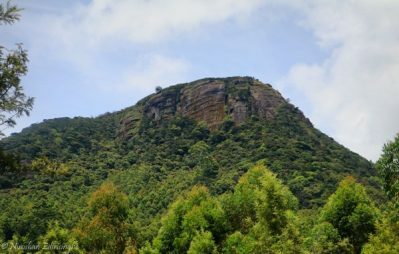 Hawarimana is a peak situated at Upper border of Knuckles massif. It is bordered by Karagahathenna, Gammaduwa, Sandamadala, Karagahathenna Mini World’s end and Hinguruwatta Mountain. Hawarimana has unusual appearance. It has two peaks with saddle like a gap. කතා කරගත්ත විදියටම අපි හවස 6.45 ට කොලඹින් මහ ඔය හරහා අම්පාර බස් එකට නගින්න ගමනට කතා උන මම ( කාවින්ද ) ,රෝශන සහ චිරාන් මල්ලි ලෑස්ති උනා.උදේ එනකොටම ගෙනියන්න ඕන බඩු මුට්ටු ඔක්කොම බෑග් එකටත් දාගෙන මම ආව වගේම රෝශනත් ඒ විදියටම කරල තිබුන ගමනේ අනිත් සගය වෙච්ච ලක්මාල් මහියංගණයෙන් අපි එන බස් එකට නගින්න කතා වෙලා හිටපු නිසා එයත් බදුල්ලෙන් ටයිම් බලල මහියංගණය ට එන්න කතා උනා. Karagahathenna mini world’s end is a hidden paradise situated at the edge of an abounded tea estate. It provides a superb view towards North central province of Sri Lanka. 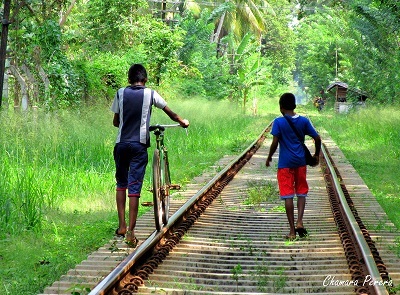 I did not have a desire to do a rail hike along Puttlam line though it is very close to my home but, I tempted to do it by seeing the photos of Ashan’s rail hike from Chilaw to Puttlam. Mahakudugala is one of a peaks comes in Rawana legend. It says King Rawana’s body was hidden here 5000 years ago. This is considered as the eleventh highest peak of Sri Lanka with 2096m height situated in Nuwara Eliya district.